Community Memorial Healthcare, Inc. serves our community with high quality health care, featuring the latest in technologies and treatments, delivered in an environment that promotes healing. Our role as a rural community hospital is immeasurable. Access to quality health care is critical and Community Memorial Healthcare provides health care services for those we work and live with - our neighbors and friends. We have expanded the scope of health care to encompass the full continuum of care that emphasizes health promotion, disease prevention and treatment for all members of your family. That's why we offer a full range of services to treat you. Whether you are admitted as an inpatient, visiting us for outpatient services, or attending one of our community education programs, all of us at Community Memorial Healthcare consider it a privilege to serve you. Community Memorial Healthcare first opened its doors to patients in March of 1958. Known as Community Memorial Hospital, the facility was organized as a private, not-for-profit corporation and became a reality through contributions from the people of Marysville and the surrounding area. Throughout the years that followed, Community Memorial Hospital changed and grew to address the area's health care needs, undergoing several expansion and renovation projects. In the fall of 1997 the Hospital changed its name to Community Memorial Healthcare. 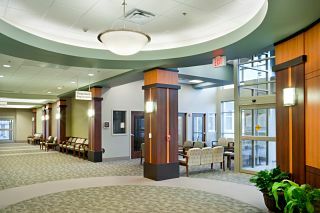 In March of 2011, we opened the doors to our new $17.3 million state-of-the-art hospital facility. We celebrated our grand opening and dedication on June 26, 2011. Emphasis in the new 50,000 square foot hospital facility is placed on patient care areas to allow CMH staff to better serve the needs of patients and families, with vast improvements made in accessibility, enhanced services, and patient privacy. Today, Community Memorial Healthcare offers a wide range of services, including prevention, diagnosis, inpatient and out patient treatment, rehabilitation, transitional care, home health, wellness and education.